I know it’s a breezy and chilly Saturday afternoon, but I figured I would do my fun fact friday post anyway. The largest hailstone ever recorded fell in Nebraska in June 2003. 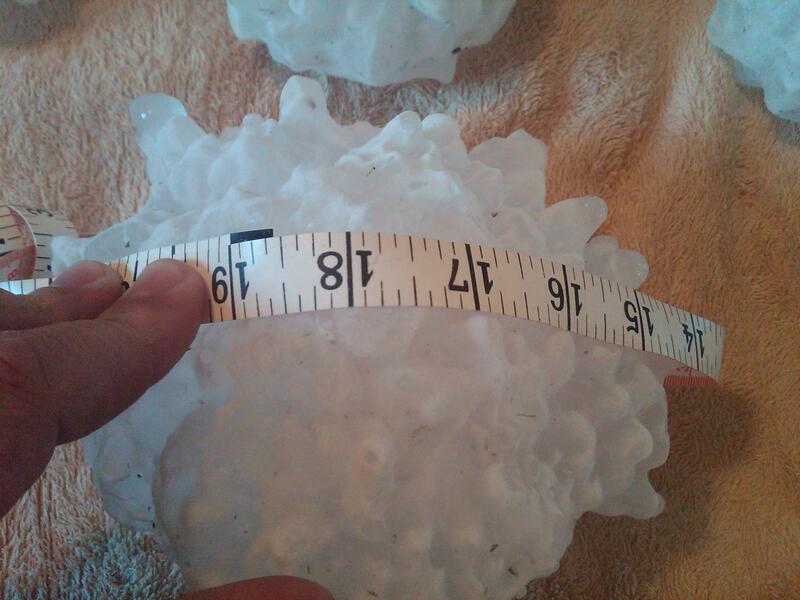 The size of the hailstone was 7 inches and was as large as a regulation soccer ball! Hailstones are formed by intense updraft accompanied by freezing temperatures in severe thunderstorm clouds. The stronger the updraft, the larger the hailstone. Temperatures will climb into the 60s for the rest of the week as a Bermuda high (normally seen in the summer months) sets up to our southeast. Wednesday should be the nicest of the week with sunny skies and temperatures in the 60s. On Thursday, a string of weak disturbances will move through, making for damp, dreary, and warm conditions. By Friday night, we are looking at a potential large storm coming just west of the area. 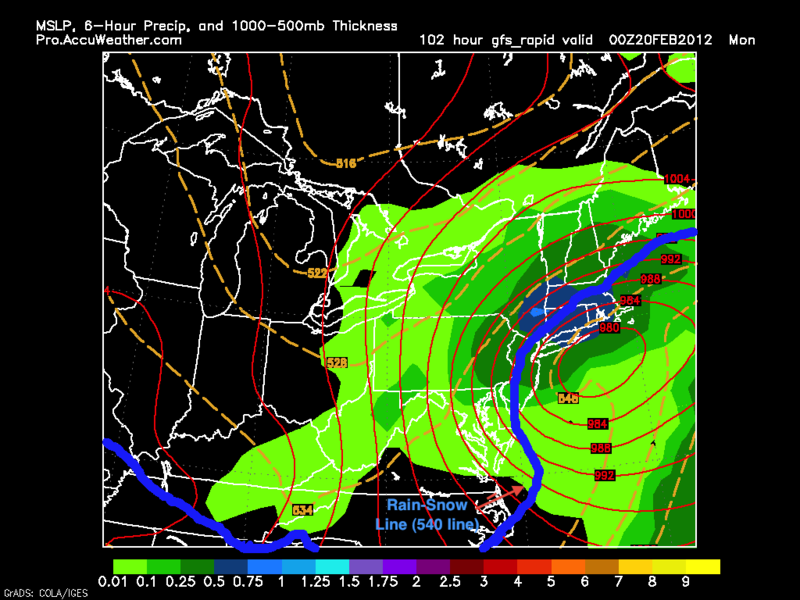 This westerly track means we will be on the “warm side” of the storm, and our precipitation will be in the form of rain. After this storm moves through, windy and cooler conditions will take over for the weekend. Next week will be fairly quiet until later in the week and weekend. A storm system has the potential to affect the area either Thursday, Friday, or Saturday next week. 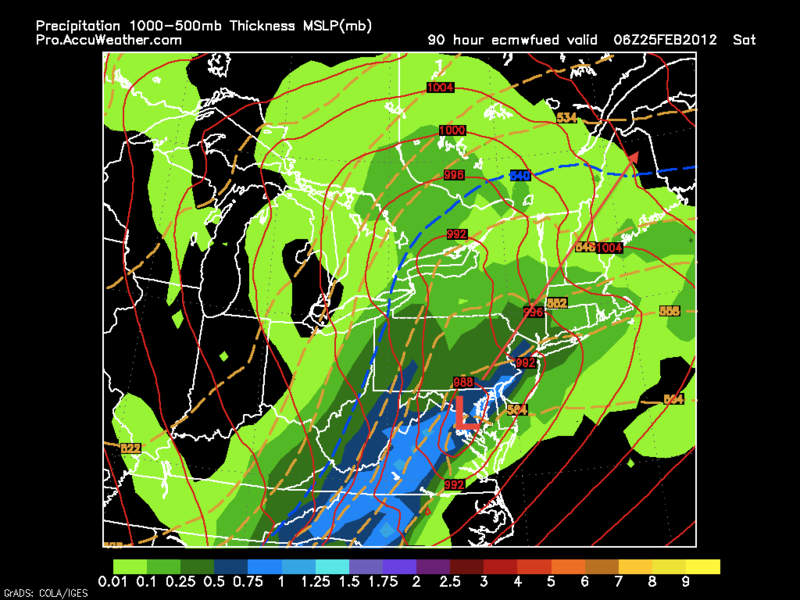 Details about this storm are vague, but it could have the potential to bring in enough cold air to support snow. Once again, because the NAO and AO are still positive, it will be tough for a storm to wrap up and ride the coast. My gut feeling is that the storm will suppress to our south, much like the one this past weekend. Well, it looks like the storm tomorrow is going to be suppressed to the south. As I said on my last post, the teleconnections just do not support a major storm, and the jets just will not phase in time to turn the storm northward. 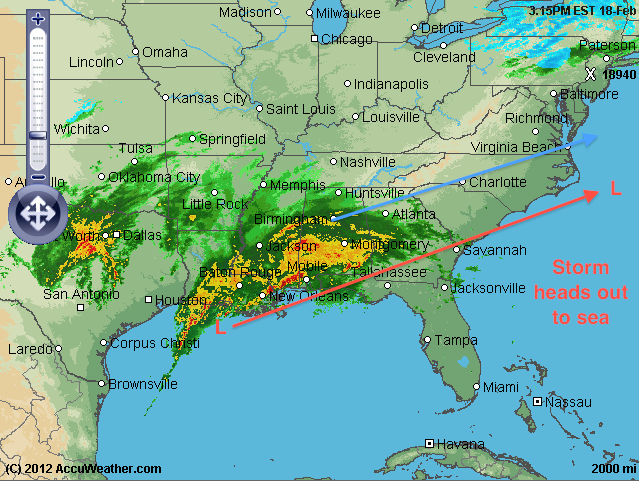 Right now, the system is wrecking havoc on the south with severe storms and heavy rain. 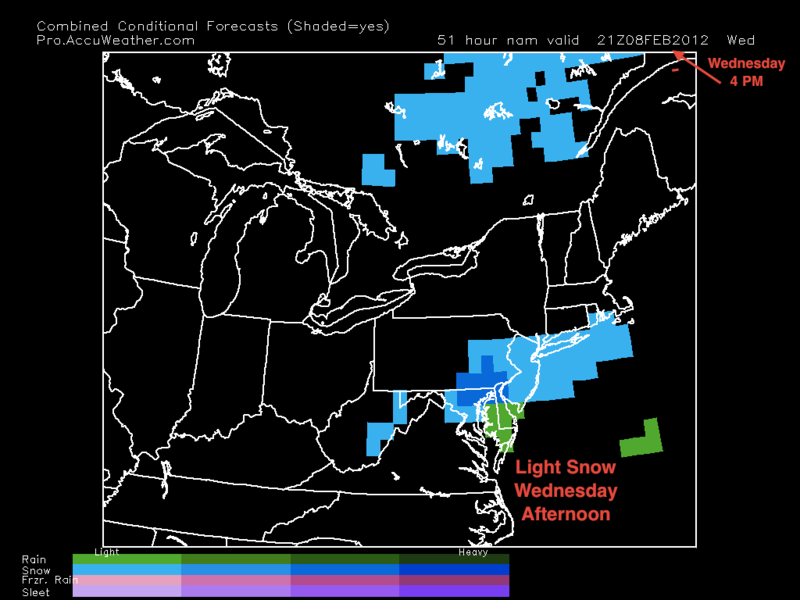 It will continue its eastward track and drop some substantial snow fall in Virginia. The week ahead will be another quiet one, with temperatures going back into the 50s and high 40s. Winter is starting to transition into an early spring. Our chances for a snowstorm will continue to diminish as the jet stream shifts and the sun angle increases. Our next chance for some precipitation will be next Friday. Yet another nuisance snowstorm will affect the area early Saturday into the afternoon. This system is a bit more expansive than the one that hit on Wednesday. Moisture is being brought up from the gulf, and the storm has the strength to bring in its own cold air. The models have been fairly consistant about this storm and it is looking like 1-3 inches around Philadelphia with 2-4 inches further north. New York City could even see 3-6 inches as the storm strengthens over the Atlantic. Roads will be slippery tomorrow morning, but they should be mostly wet by the afternoon. Following the storm, extremely cold air will be coming in. It will be windy and freezing on Sunday, as well as Monday. 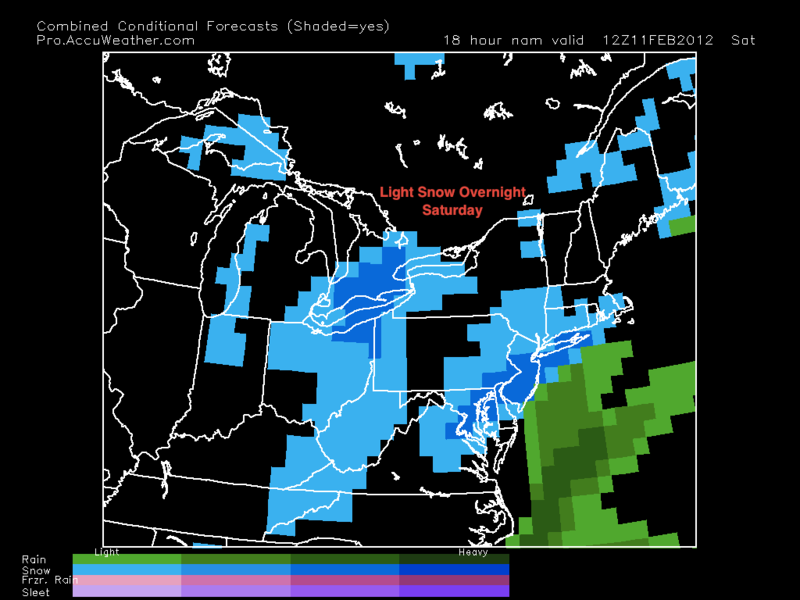 Our next chance of snow will likely be Wednesday, probably only a coating. 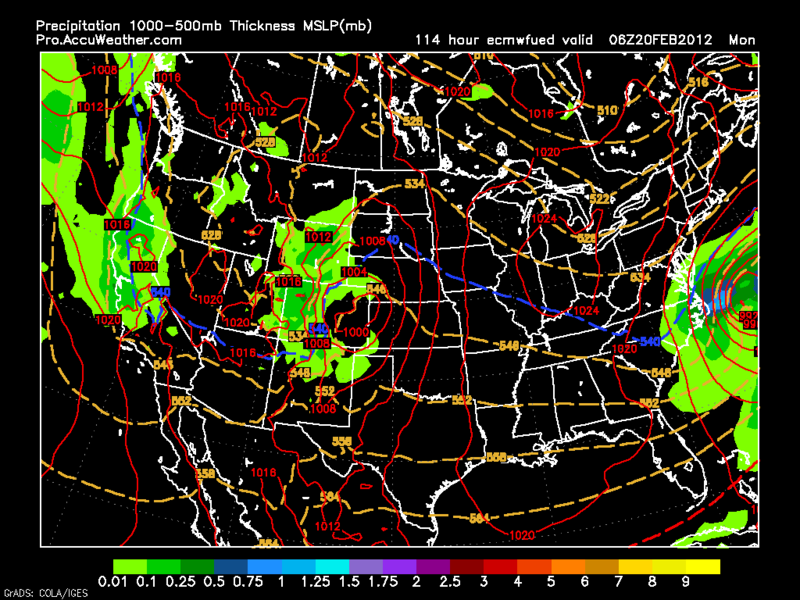 Models have been agreeing on a small system moving through the area Wednesday afternoon. As of right now, the snow showers should start sometime after midday and continue into the late afternoon before tapering off. Because the snow will fall during the day, roads will be wet and the snow will only accumulate on grassy surfaces. I am calling for at most an inch of snow on the grass by Wednesday evening. Once again, nothing to worry about. In the longer range, the prospects for snow have been looking extremely promising. Next week will be cold and dry. The setup will not be favorable for rainy/snowy days. But…. the forecast models, as well as the telecommunications, have been showing a stormier setup the week after Presidents Day weekend. The cold air will be in place; all we need is a buckle in the jet, favorable high positioning, and a storm for snow. I know it has been an extremely disappointing winter for the “snow-geese”. Personally, I was looking forward for some fun in the snow my senior year of high school (as well as some snow days). But, some things do not work out. Many meteorologists have been on their heels this winter, including me. Many storms have not turned out to be as expected, and the cold air just hasn’t shown up for the party. Late February and March will hopefully be an exciting end to the 2011-2012 winter. I am introducing a new feature to Philaburbia Weather called Fun Fact Friday. Every Friday, I will introduce an interesting and amazing weather fact. This week, I want to elaborate a little on the frozen Niagara Falls in 1932. The falls froze twenty years earlier in 1911, but no picture evidence exists. In 1932, however, the falls froze completely over again after a brutal cold stretch. One almost surreal picture remains of the frozen falls. Enjoy.